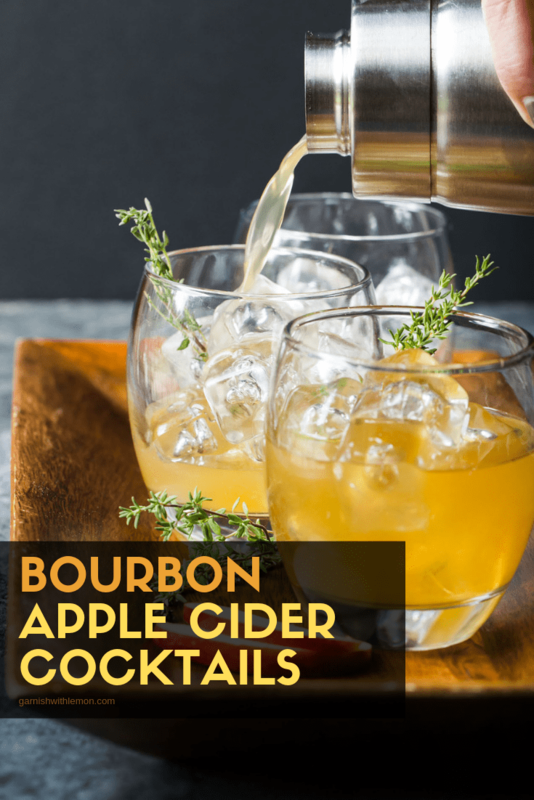 These Bourbon Apple Cider Cocktails will warm you from the inside out and keep you toasty all season long – the perfect fall cocktail! We always pick up a few gallons of fresh apple cider when we visit the apple orchard every fall, and my kids devour it in quick fashion. But I always make sure to squirrel away enough for Pat and me to enjoy these smooth and seasonal Bourbon Apple Cider Cocktails after a long week. It’s one of our favorite fall cocktails. 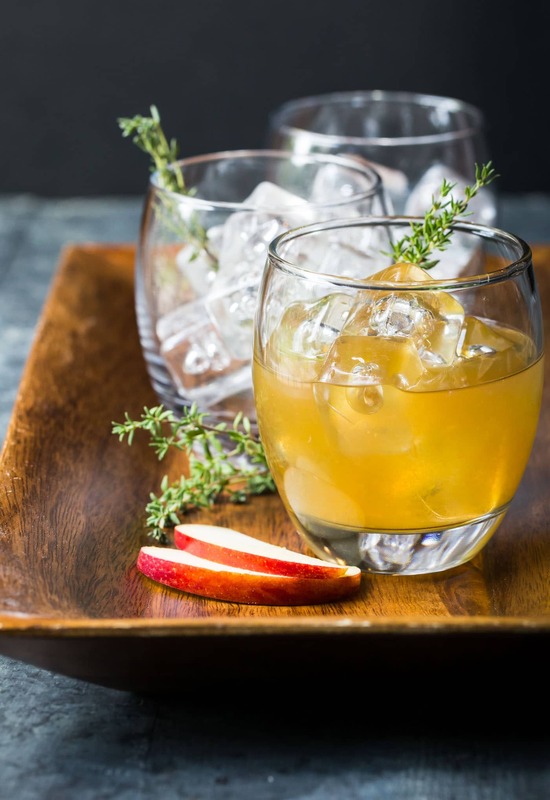 Two kinds of liquor – bourbon and applejack brandy – are beautifully balanced by fresh apple cider, lemon juice, and an herb-infused simple syrup to create a truly sippable cocktail. I usually make the simple syrup a few days in advance and keep it in the fridge until I’m ready to use it to make cocktail hour even easier. Tip: No time to make the thyme-infused simple syrup? You can also swap in regular simple syrup, and this fall cocktail will still taste great! Hosting a party? These Bourbon Apple Cider Cocktails can easily be multiplied as a batch cocktail for your guests (I highly recommend adding these to your Thanksgiving menu). Or tuck a few into a thermos the next time you tailgate for the big game. 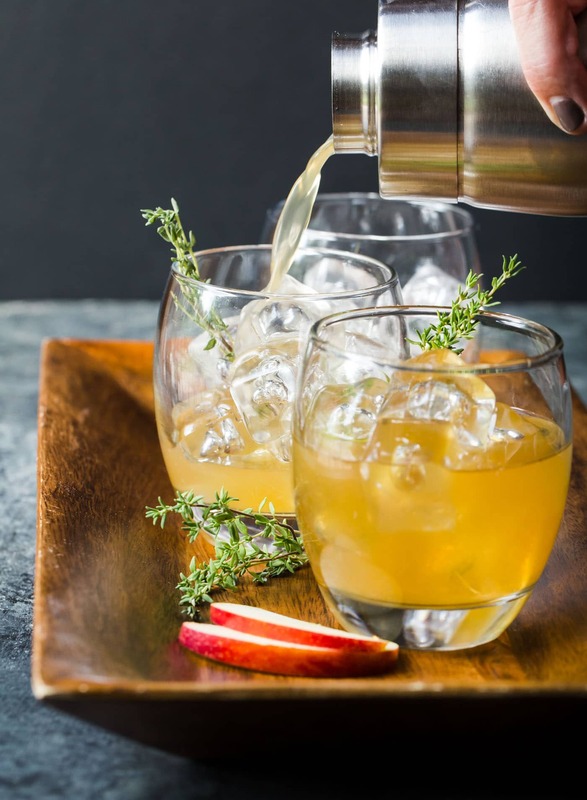 However you enjoy them, these Bourbon Apple Cider Cocktails have all the makings of a great drink – simple, seasonal and delicious. Sample a few more of our favorite fall cocktails! This has all of the makings of a perfect fall cocktail. Combine sugar and water in small saucepan. Stir over medium heat until sugar is dissolved. Remove from heat and add thyme. Allow to steep for 15 minutes. Strain and refrigerate. Fill a cocktail shaker with ice. Add bourbon, applejack, apple cider, lemon juice, simple syrup and bitters. Shake and strain into ice-filled glasses. I like ciders but this type in particular! I think that your recipe is very clear and easy to make – thank you very much for sharing it!